This entry was posted on Saturday, August 13th, 2011 at 12:07 pm and is filed under Higgs Hunting, Large Hadron Collider, Supersymmetry. You can follow any responses to this entry through the RSS 2.0 feed. Both comments and pings are currently closed. 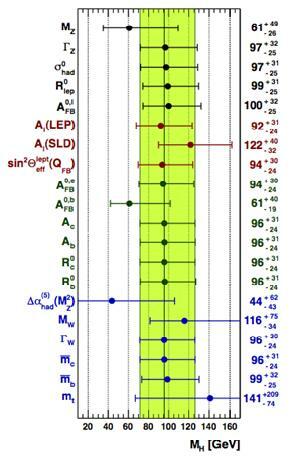 85 Responses to Has the LHC seen a Higgs Boson at 135±10 GeV? Thanks for the update!! Data collected before the next tech stop should definitely shine some light. Exciting times…. Dear Phil, I got here from Twitter of RebelAlfons. You know, it’s fun – my blog was the first source on the Internet that discussed about 144 GeV specifically, so it could be true. But I really don’t see any much stronger evidence than e.g. the 116, 119 GeV Higgs here. Lubos, do you have time to do a combined plot similar to Phil’s before the August meeting? Or do you think the error would make it not worth your while? It would be fun to compare how close you both get. Dear Carla, I’ve seen some newer graphs – like Phil did – but I am not sure about their interpretation, what they really show and how they were obtained, so I am not going to combine them. Except for these (two) newer graphs, the situation for me remains what it was at the end of EPS-HEP 2011. So it remains inconclusive to me. The data that have been collected by now – 5/fb combined in ATLAS, CMS – are probably enough to say something more unequivocal and I choose to wait. Wise choice. I think the experiments are taking the same choice: wait until something conclusive comes along. To be honest, I prefer waiting for some mass plots of single different decay channels, including proper error bars… This kind of plot shown here could mean everything or nothing, depending on your optimism or pessimism. But thanks a lot for sharing! Definitely exciting times. There’s more serious flaw in Phil’s presentation than violating someone’s subjective preference for one-channel plots: Phil mixes one-channel plots and multi-channel plots. In particular, the 4 simulated “early signal” plots only show the WW channel – which produce neutrinos, and their mass is ill-measured, which is why the graphs are broad – but his global combination contains lots of other channels as well. These other channels should be able to make a sharp peak near the Higgs mass if it were already becoming accessible. Yes, I see the problem. That’s why, without any hurry, I am looking forward for a gamma-gamma decay-channel invariant mass plot, including error bars (!). Small systematics and a clear signature allow to detect the SM Higgs or MSSM higgs and also measure its mass accurately. We just have to be patient. It is really amazing how well the LHC works. ATLAS has already recorded 2.3 fb^-1; times five and we have our 3 sigma (or not) in combination with the CMS data. So the data already exists for these “top possibilities”. I prefer a multi-Higgs solution from a theoretical viewpoint, but I think the present evidence remains consistent with one particle. I agree that the diphoton channel may have a more narrow signal but it does not have much effect here above 125 GeV and below 125 GeV the excess is less strong. I’m not saying that an additional lighter Higgs is disfavoured, just that evidence for it remains too weak. 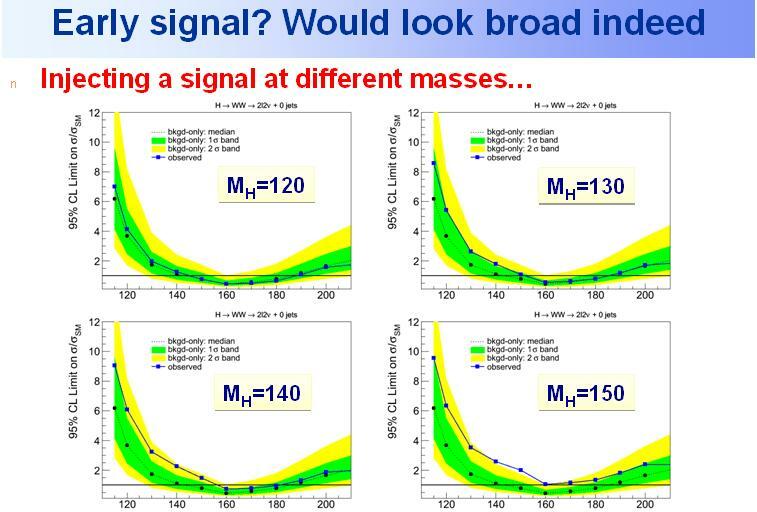 The signal is also consistent with a Higgs at 130 GeV and another much higher, say at 600 GeV. Correct me if I am wrong but I think this is also a good possibility for SUSY. If they are doing their job properly they will also show combined plots for the individual channels and more examples of expected signals for different Higgs masses, for the combined plot and the main individual channels. Without these we cannot be totally sure what the signal is consistent with. If they dont show these plots some theorists will start doing it for them. Of course three times the data would do much more to make things clearer but they will still need to start showing more of these detailed plots as the signal gets better. Competing rumours sounds like a healthy situation so keep them coming. Amazing how everything converges to this 145 GeV pion (I did not bother to check whether the mass is actually 144 GeV: this is told in some posting in my blog) of scaled up hadron physics. This new pion should be familiar to everyone after all this merciless brain washing;-). To me this strange 145 GeV particle represents the last piece of jigsaw puzzle. Its existence would demonstrate that rational thought combined with intuitive insight can indeed transcend the mere common sense thinking based on maximization of conformism. My prediction: After the bump is accepted as real, the question whether the Higgs candidate is scalar or pseudo-scalar arises. And many other questions. Eventually we must admit that new physics is there!;-). By the way, it is quite striking that the broad excess seen here coincides exactly with the broad excess seen by CDF in Wjj. If we ignore the fact that D0 did not see it, is there a possibility that the same particle could account for both? Well, a bigger problem is that it is Wjj and not just jj – so it has to be produced in association with a W-boson. There’s no reason why this should be the case for the Higgs or any Higgs. I cant see that working either, so it must just be a spooky coincidence then. Dear Phil, a Z’ boson, for example, can’t decay to two W-bosons. The interactions of gauge bosons are given by the structure constants and the new U(1) commutes with the electroweak SU(2). Don’t get caught up in an Alejandro-Rivero-or-TGD-style numerology. That a wide bump has a similar position on the mass axis as another (fake) bump is no reason for any far-reaching interpretations. As of today, my cauldron boils a soup of contradictory hints: The sBootstrap numerology gives a main role to the top quark and it needs a SU(3) to do the pairings, so it should enjoy some variant of TopColor coming to real work. But taken (the sB) in a strict interpretation, no new scalars are expected, only Higgsinos, winos and zinos… no place for technipions. On other side, the Z0/pi0 decay width coincidence could also be more interesting with a composite, coloured scenary. But for the decays to coincide, color and topcolor should have some unexpected relationship, plus a duality with electroweak force. And still other coincidence linking the mass of charged leptons to QCD appears in Koide equation, whose basic mass is the same that the constituient mass of quarks. Even with all of those, I am not tempted to add to the soup a so rough coincidence as the CDF/LHC one. Guess we have at least other six months to wait. I also have ideas about using S-dual SU(3)’s or G2’s to explain both three colors and three generations. And I have ideas about massive Z-primes and W-primes that couple with right-handed neutrinos. But we need a fundamental mass scale from SOMEWHERE. If that mass scale is supplied by a Technipion, then ‘mass’ would actually originate with the Technipion’s composite ‘rishons’, and be subsequently mediated by the Technipion. Can you explain why a ‘rishon’ would have mass? In my opinion, the answer is no clearer than why quarks (and therefore Pions) have mass, and this will always bring us full-circle back to the need for a fundamental massive scalar. Please recall that the Pion has effective mass primarily due to the kinetic and potential energies of its component partons (quarks and gluons). Philip’s LHC Higgs Combo plot had an interesting deficit near twice the top quark mass (that seemed to disappear with the inclusion of Tevatron data), and some sort of interesting physics (destructive interference between a SUSY Heavy Higgs and SUSY Pseudoscalar Higgs or an effective Pseudoscalar top-top-bar Technipion?) may be occuring there. But I think these plots show more evidence for one or more fundamental massive scalars than they show evidence for a Technipion. Thanks I’ve already reached that conclusion above. It is always worth checking the possibilities when things coincide though. at EPS HEP 2011 CMS saw 16 events and ATLAS 18 events. and is also roughly the Higgs Vacuum Expectation Value. Higgs around 160-210 GeV which is physically roughly where the Higgs encounters the edge of the Triviality Boundary. Higgs around 110-160 GeV which is physically roughly where a Higgs is needed for the Standard Model to work up to the Planck Scale. the Golden Channel is somewhat weaker in the 110-160 GeV range so a combination of channels might be necessary there. Thanks Tony, this confirms that the minor excess at 600 GeV is due to just one event as I thought. It mustn’t be forgotten that there are backgrounds that predict near this number of events without the need for any Higgs. I hope to see 3/fb in the Golden Channel in the near future. Thanks for this lesson of sociology, Phil. It’s great to see how rumors are (often?) created out of thin air, including all the details. Such an insight reinforces one’s skepticism. I’m just keeping it going. 2) warn everyone that my statements come from someone who is not a professional experimenter, so that people shouldn’t think that I am just forwarding a conclusion made by a professional experimenter, and those who wouldn’t ever pay any attention to theorists’ amateurish manipulation with the data could completely ignore what I had to say. You’re clearly inventing your own interpretations but – maybe because you don’t trust the influence associated with your name, which might be just because of your unjustified lack of self-confidence – you try to spread the credit to others. That’s why you call it a “rumor”. But there’s no new rumor here. You know it very well. It’s something that started in your head. I was studying your viXra Unofficial LHC Higgs Combination plot from August 7, and see a possible signal between 135-150 GeV that I might call 142±8 GeV. Of course, 135 and 144 GeV both fall in this range, but what prompted the title change? It is a broad ‘peak’, and the inclusion of Tevatron data may have reduced the peak value by a couple of GeV – maybe down to 141±7 GeV (plus whatever systematic error) on your unofficial global combo plot, but I personally wouldn’t count the signal @ 125 GeV as particularly significant when compared with the signals @ higher neighboring energies. If you are hedging your bets for the SM Higgs, then 119 GeV may be a better bet, but these plots (and especially the early LHC plots) seem more complex than that. I am just using the Sphicas plots to get an idea of what the signal could be consistent with, but we need more of those plots to get a better idea. I dont think the signal is consistent with a 119 GeV Higgs on its own. There could be one at 119 GeV and another at 144 GeV but that would be taking the details of the plot too seriously. Also, if there are two Higgs then the heavier one can decay into the lighter one and without more simulations it is very hard to say what can fit. Phil–FYI, if there are two scalars, then the heavier can’t decay into the lighter, since they are orthogonal (in standard 2HDM terminology, there is no HhZ vertex). If one were a pseudoscalar, then that would happen, but pseudoscalars don’t couple to WW or ZZ. The LHC has a lot of ground to cover in a very little amount of time. I doubt any of the experiments will want to rush into conclusions. How long did it take for the Tevatron to come out with the first combination since they began taking data? The Tevatron were slow because they had a lot less people, no competition and a perhaps a different policy. They have been quicker this year. CERN are making big outreach efforts and that includes publishing results as quickly as possible. Perhaps it is because they have funding from a lot more nations. Funding decisions are being taken all the time and are influenced by results. However I agree they wont rush into conclusions. They don’t need to yet. They can make a good inconclusive statement that will still be good enough to make the press. Interestingly I think that much fewer computational means and somewhat less knowledge/experience were probably what the Tevatron lacked. As for the press, the main message from an inconclusive combination will not be that a great giant combination with hundreds of parameters and observables can be tamed into giving a sensible result, but rather that the LHC is, well, inconclusive, and most certainly unworthy of news. Whoever can appreciate that the technical part can be done, will appreciate it without much regard for the contents of the result. And whoever wants a solid physics result will appreciate that it needs time to ripen, regardless of the amount of manpower that is thrown at it. If a single Higgs is found with mass around 135 or 140 GeV its pretty bad news for future funding of particle physics, as it would suggest that the standard model is good up to high scales. This is a pretty boring scenario, but at least it would kill 20 years of crappy hep-ph papers. I suppose anthropic minded people (who think the hierarchy problem is solved by anthropics) would be feeling good right now (though anthopics is not very predictive). I agree that this would be a dissapointment. It would give us no new information to understand inflation, dark matter or unification. But it is too early to wory about that. They need a few thousand /fb at 14 TeV before they can say there is no more new physics to be seen at the LHC. I agree, but the odds of there being new physics that LHC can discover have decreased somewhat already. By the way, I never thought LHC would tell us anything about inflation, as inflation operates at an extremely high scale and is very unlikely to be connected to any light fields. But I do agree that it *could* have given us insights into dark matter and possibly unification (for instance, by discovering susy and extrapolating), as well as a general picture for high energy particle physics, by discovering a whole new spectrum, and possibly learning something about baryogenesis. Dear Bob, as long as the luminosity of the LHC – and later, energy – keeps on growing exponentially, the probability of new discoveries per unit time is pretty much constant because old and new physics is more or less uniformly distributed on the log scale. Papers might have been concentrated below 1 TeV but that was because of wishful thinking, hype, and sensationalism. When we know that certain models with new matter below 1 TeV are wrong, there are still good reasons to think that there may be new particles below a few TeV, and so on. The LHC is not at the end of its skills yet. Far from it. Do I understand correctly that the Tevatron people are claiming to exclude any standard Higgs boson between 124 GeV and 286 GeV? If you read the abstract, this exclusion is for the SM Higgs with four generations. http://atlas.ch/blog/ says they’ll present results with >2/fb for Atlas alone at Lepton-Photon. So we’ll have double the data for each experiment in addition to the combined data with 1/fb each. I say it’s time to stop playing silly games, and leave the data analysis to the experts. I say it’s time to stop playing ‘scientific’ politics, and leave the various possibilitys to be choosen by the general public. Wrong: the post says that by Monday there will be more than double the data. Not that double the data will be shown. The outcome of searches in more than 2/fb collected by Atlas. ATLAS achieved 2/fb recorded by the beginning of August and that does not take into account data quality checks. Monday we’ll see. The more data, the better for Physics! Jin He: “it’s time to stop playing ‘scientific’ politics, and leave the various possibilitys to be choosen by the general public”. Seriously? Science is democratic only inasmuch as different people testing the same hypotheses should reach the came conclusions. Science is not democratic – on the contrary, the best science, that one worthy of Nobel prizes, tends to be rather absolute – in what regards results. So, if the general public wants to “choose” they had better join the ranks of those co-opting answers from Nature. Phil`s great work here is NOT “silly games” !!! Nobody who does not like it is forced to read these posts on this blog ! in case You missed those all that was a misunderstanding, disappointment with null connection to physics. You may ask what or what for was that then , imo it was and unfortunatelly still is some kind of science propaganda. i can imagine it is important to draw public attention, keep public interest in hep at some level, influence donators and science patrons funding but in any case it is science itself. One can appreciate Phil’s efforts, i admire his work, but one can not confuse it with science. science is to be done by experts. Halluelajh! I needed thisyou’re my savior. you overwhelm us by bizarre sentences such as “science is to be done by experts”. What you’re promoting is not science – it’s fascism, with some irrational worshiping of predetermined “authorities”. This has nothing to do with science as we knew it in the last 400 years or so, since Galileo etc. Phil may be missing some points and some of his steps may be less reliable than if done by someone else, but this is true to one extent or another for any other human being, too. It’s not clear to me what’s your point of visiting this blog if your judgment about the content of this website is so poor. What Phil is doing is considered relevant by many others and it’s not harmful because within weeks or months, all errors he may have done are identified and fixed, perhaps by more reliable places. Also, you’re completely wrong that Phil’s expectation of a major Higgs discovery behind the corner is an artifact of his ignorance. When it comes to this question, his expectation is totally aligned with most of the people whom you would – hopefully – call experts as well. So please calm down. What Phil is doing may be amateurish, but it is essentially scientific research. What you are defending is not scientific research but fascism, censorship, bullying, and intimidation, and if you were posting similar tirades on my blog, I would have banned you a long time ago already – which is what I recommend Phil to do, too. Hypothetically, if both Atlas and CMS have 3.5 to 4 sigma evidence of a Higgs and Phil is the first to post a combined plot with >5 sigma and announce a discovery, would you consider the Higgs discovered or not? I guess it’s meaningless semantics; we would consider it discovered even before seeing the combined plot and consider the eventual announcement by the LHC collaborations the official confirmation regardless. Either some people just aren’t curious and miss the slightly subversive nature of science completely, or they are in a collaboration themselves and see their esoteric art tainted by others’ efforts. How can you be a scientist and never feel the urge to try and arrogantly question and rethink the work of “experts” in all kinds of fields, just for the heck of it. It might be the only citation of Feynman that agrees with your thinking. I think that lack of logic is fascism. And your posts are full of logical mistakes. It is an awful situation because one has to be logic to detect logical mistakes. what are you talking about, kevin? Dear JollyJoker, if the task will be to merge two 3.5-sigma signals into one 5-sigma signals, I can do it as well and don’t need Phil 😉 although I will still be curious what he will say. Well, I may try to get ahead of him again in other cases, too. I will personally consider the existence of the Higgs in a mass interval settled only if its mass is known plus minus 2 GeV or so. (The width of a light Higgs is well below 1 GeV.) Some 5-sigma excesses in a broader interval etc. can mean many other things once you realize that the Standard Model is not necessarily the full story and there are increasing experimental hints that it’s not. In MSSM or any other model, the cross sections for Higgses are different than the SM cross sections for one Higgs and there may be other particles etc. There’s a lot of potential for premature conclusions. Thanks, Alex! Exactly, curiosity and independence are a basic instinct of a scientific mind. And I don’t know how someone with a scientific mind could try to fight against their existence inside the minds of others – even in minds of others that make mistakes. Dear Kevin, the lack of logic isn’t fascism: the lack of logic is irrationality. Fascism is something completely different and has something to do with power in a whole nation, not with logic. So I guess this mistake in your reasoning probably invalidates the rest of your comment, too. Sour, sour, Lubos ! Ye, a competition of the best blogs would be nice. Maybe people like me would learn something too? Good suggestion. But then it should NOT be so SUBJECTIVE, because that is long from science. Scaling or not? Weak or strong? Light or heavy? Maybe the 144 ‘bump’ is only a shadow, and the real Higgs, if he is, is much heavier? I have seen very few pictures of really heavy particles. Why? Franca has a model, also with a massgap (dual quasiparticle). There is something wrongly thought with the Mexican Hat and potential virtuals? The natural thing would be a dual Higgs? Oh, no, Lubos, you misunderstood. I thought the competition was between you and Phil. I have absolutely no qualities to take part. I just educate myself through you all. You are my teachers. If we must wait for Aliens or Higgses, I really don’t know who comes sooner. Maybe you are right, and it is the Aliens? But then I forgot – you cannot take part in the competition, because you have no theory of your own. So we must leave the whole thing to Phil, after all. Nice suggestion, though. Currently, according to experts (dictators? ), mirco-physics is done (Standard Model); macro-physics is done (Big Bang), middle-physics is done (Holliwood Super-stars). In the past, according to experts (dictators), mirco-physics was done (Newton Dynamic Orbits); macro-physics was done (Epi-Circles over epi-centres), middle-physics was done (Kings and Queens). How do those “dictator experts” survive? The answer is the money which flows to their pockets from the technological advances which are made by very very few real experts like Copernicus, Newton, Galileo, Planck, etc.. Unfortunately, I (Jin He) has discovered that humans are organic lives. The technologic advances so far are far enough for the organic lives of mankind to survive. The slaves do not appreciate IPhones, IPads, ITunes, etc. In the future, how can those dictator experts survive anymore?? I am greatly concerned of their money resources for them to order their Dapper Suits for Nobel Ceremony in their day-dreams. I am greatly concerned! Today’s WallStreet stock-Markets tell all the stories. The Nobel Prize ceremony will have to be played inside India’s slums! If the past is the best predictor of the future, then the new mystery bump will go the way of all past mystery bumps. We should have some indication of the way things are going to play out by Sunday night, or earlier if rumors leak out. Super-Kamiokande Collaboration: No WIMPS (see arxiv.org 8/17/11). That’s the point, it’s not a mystery bump. The fact that it was expected roughly where it is found, makes this quite a different animal from a bayesian standpoint. Could “it” be due to an inadequately subtracted background? The practice of calling “null result” or “background” to the “higgless standard model prediction” is confusing. It is not a bunch of particles coming to the detectors from elsewhere outside the CERN, it is the actual production of the LHC collider. Ok, so we could put it as follows. 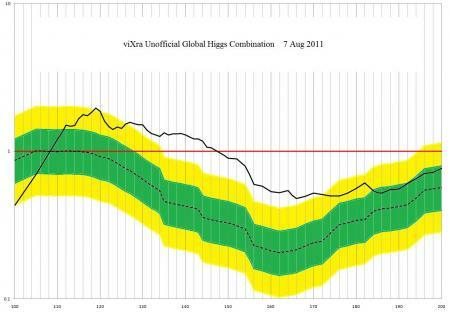 Is it possible that the expected signal in the 120-160 GeV range has been underestimated? Alternatively, could the observed excess shrink in larger data samples? If so, then there might be no statistically significant evidence for anything. So the bump is gone or weakened? This would mean that a large part of the remaining mass window is excluded for an SM Higgs, perhaps nearly all of it at two sigma? I wonder that the XXXXs are all about. The commenter is either a naughty in-the-know or a naughty pretend-to-know. In either case, self censorship is the fashion. it certainly could be quite a day, indeed, robustly, landscapeably so. Note that we will not be booking spots on the Colbert Report, or going to fancy conferences to share fantasies. No, we will be studying nature and doing our best to ignore the hyped pseudo-science that dominated particle physics for decades. it certainly could be quite day, robustly, landscapeably so. We are in the midst of a revolution in physics, like it or not. Feel free to deny that if you have banked your whole career on the old paradigm. However, the fact is that the old paradigm can no longer predict much of anything. It is lost in the cosmos without a reliable theoretical principle to guide it. The new paradigm, on the other hand, has definitively predicted what the galactic dark matter is composed of. This was published in 1987, in the Astrophysical Journal, vol. 322, pp 34-36. One component of the definitively predicted dark matter was a huge population of unbound planetary-mass objects that would be found throughout the Galaxy. Guess what was reported in Nature in May 2011 by Sumi et al. Hundreds of billions of unbound planetary-mass objects roaming free in the Galaxy. Compare that with the 40-year dismal failure of the WIMP “scenario”. If you give a fair hearing to Mike Hawkins excellent preprint (arxiv.org) entitled “The case for primordial black holes as dark matter”, you might begin to see the dark matter in a new way. General relativity needs a new symmetry principle added to it, and that new principle is discrete conformal invariance, aka discrete scale invariance or discrete cosmological self-similarity. When general relativity is recast in this new form you get a discrete fractal model for nature. It predicted pulsar-planets before they were discovered. It can explain the fine structure constant and why the conventional Planck mass is such an abomination. Cheers, and welcome to the future. Wow, thank you for proving that the “Planck mass is an abomination”. Good luck convincing people that you are not a crackpot with catch phrases like that. I will let nature speak for the new paradigm, since nature is so much more eloquent and convincing. However, I cannot resist pointing out that calling anyone who questions your assumptions a “crackpot” is a common technique these days and a rather shabby one. We shall see who understands nature and who has lost their way. Congratulations! 6 seconds of effort and you discover that your model is rubbish. Now you can spend your time doing something else. Have fun! I hate to break it to you but in different paradigms you can get different Planck masses. I obviously know what the conventional Planck mass is, and how it is calculated. Is there anything in nature that corresponds to this bizarre mass? Pray tell what! I doubt that you have learned how I get my far more natural value. You could look at …arxiv.org/abs/astro-ph/0701006 which would explain why my value is correct and your value is wrong by 10^19. But I fear you could not allow yourself to think that I might be right. That’s ok, others might be more receptive to radical new ideas. I am not interested in further polemics. If you want to talk science,let me know. Congratulations! 9 seconds of effort and you discover how the most fundamental pieces of nature (quantum mechanics and general relativity) correspond to this mass. Have fun! Discrete Scale Relativity does not fundamentally conflict with GR or QM. To the contrary, it is the one decent idea that has a chance to unify them. Do you get all your physics knowledge from Wikipedia? Here is a simple question, asked without guile. Has the gravitational coupling factor inside an atom, or inside a subatomic particle, ever been measured? It is important to know the scientific answer to this question. What is your answer? It is a shame that I missed this exchange last week. Quite simply, Fred is correct, and RLO lives in a self-similar alternate reality. RLO – This factor of 10^19 that you two are discussing is EXTREMELY important. This is the root of the Hierarchy Problem (a Scale Problem). The Hierarchy Problem says that radiative corrections should not allow a stable Weak Scale mass AND a stable Planck Scale mass. The natural solution is Supersymmetry, and I would thus claim that Scales (Fractals) and SUSY are compatible. Your criticism against Laurent Nottale’s four scales is duly noted. I would tend to agree that self-similarity implies an infinitude of scales. I can think of two ways in which Nottale might be correct: 1) four scales – sub quantum (hyperspace), quantum, classical, super-classical (multiverse) – may be an excellent approximate solution, or 2) a modulo arithmatic may be in effect, such as Higgs=spin-0, Fermion=spin-1/2, Photon=spin-1, Gravitino=spin-3/2, Graviton=spin-2~spin-0=Higgs. Regardless – No one will take your complaints against Nottale’s theory seriously when you make outrageously incorrect claims about the Planck mass. If you are going to define something different (and 19 orders of magnitide IS different) then you should call it the Oldershaw mass (or the amu).